The Top Five Science Marketing Hits of 2013 We’re open. COME IN! Last year, I made three science-marketing new years resolutions: clean my desk, spruce up my webpage, and launch a citizen science project. The desk and the webpage—let’s say they are still works in progress. 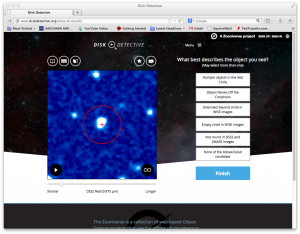 But I am proud to say that this week is the launch of DiskDetective.org, a new citizen science project where volunteers can help me and my team sort through data from NASA’s WISE telescope to find disks where planets form and hide. Disk Detective is a new collaboration between NASA and Zooniverse and, I hope, a seed of progress here towards a more open Federal government. And, gee whiz, launching a new citizen science project was much harder than I anticipated. First, there was the challenge of coming up with a project. I tend to feel that anywhere there is big data, there is a place for crowdsourcing. But humans have limits; the amount of data processing to be crowdsourced can’t be too large to manage or too small to be consequential. People’s time must not be wasted duplicating a task that machines can do better. We had to find the right balance and a way to make the task interesting but intuitive. But I am lucky to be working with a talented science team, with experts in infrared surveys like Deborah Padgett, Luisa Rebull, Mike McElwain, and John Debes who made short work of this astrophysical brain teaser. Then there was the matter of finding funding for the project. First we applied to the usual NASA ROSES programs—for three years in a row we submitted 15-page proposals to the Astrophysical Data Analysis Program and to the Origins program, to no avail. One year we also applied to a NASA Planetariums program and to a Sloan Foundation program. We finally found enough funding to get the project off the ground through the Goddard Science Innovation Fund. Then there were the many colleagues whom we had to convince that this was a worthwhile adventure. Nearly all had heard of the notion of “citizen science”. But most thought that citizen science was some kind of outreach or education. I had to explain to them that no, we are not launching some kind of make-work or “fun” science activity to entertain children. We are doing unique, novel, far-reaching science intended for publication in the literature. Other colleagues had the opposite reaction: you’re taking away work from us professionals, work that we should be funded for! Now I had to remind people that part of what’s great about science is that as a community, we aim to pursue the best research methods, even if that means we enjoin people outside our usual community to perform the research with us. And who does this volunteer work on Zooniverse and other sites? Surely, said my colleagues, it’s crazy people, obsessive-compulsive types. Or maybe it’s careless kids with short attention spans. Either way, the results could not be trusted. No, I explained. The bulk of the classifications are done by people who spend maybe an hour at a time working on the site, not by dabblers or obsessives. And we combine the results from multiple volunteers to generate robust classifications for every subject. And by the way, groups of professional astronomers are also subject to fatigue and biases when they try to make sense of vast libraries of images. With Zooniverse, we have enough manpower to search for and calibrate out many of these human errors. Best of all, I told my colleagues, when you’re working with so many eager volunteers, there’s a chance they might invent or discover something that you didn’t expect. There’s a chance that they might be smarter than you! When I suggested this possibility, my most ornery colleagues usually shut up in a hurry, and probably went off muttering under their breath. These are just a few of the obstacles we faced. There was the matter of moving half a TB of data across the country from one NASA computer to another, and then over to Adler—a process you’d think would be easy, but which isn’t. Then there are a slew of other issues related to pursuing science in the federal government, which I won’t get into (see this report from the Woodrow Wilson center for more info). Anyway, I am proud and excited to have arrived at this day. I’ve sometimes wondered why I’m lucky enough to be employed by our citizens to work at NASA—how exactly do taxpayers benefit when I write another paper in the Astrophysical Journal on a topic they might find esoteric? I can certainly think of indirect benefits. But right now, I’m certain I’m doing something well matched to the role of NASA scientist: enabling the people of the U.S. enjoy the fruits of a NASA telescope, not just showing them pretty pictures, but including them in the process, the adventure of scientific research that I thirst for. So I hope you have a moment to try DiskDetective.org and share it with your students. You might catch yourself thinking about how citizen scientists can help you with your research. The site is not perfect: the day before launch and we’re still fixing typos (and a random link to a scientology site that somehow crept in there!). But the science and the joy of collaboration are very real. There may be obstacles to launching a project like this, but I can already say it’s worth it for the excitement I’m feeling today.